In Antarctica, you can do more than see the impact climate change is having on the icy landscape. You can hear it, too. The recording is the work of Zaria Forman, a Brooklyn-based artist whose work deals with disappearing ice. 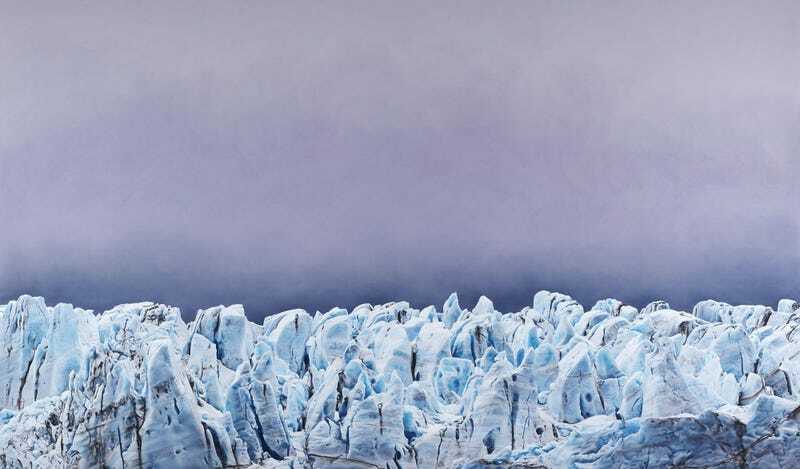 Her ethereal pastel drawings have chronicled the beauty of ice in Greenland and Antarctica, as well as the shores of the Maldives where all that melted ice is washing up in the form of rising sea levels. The incredible details in Forman’s drawings make it seem like you can almost touch the ice they depict. The soundscape adds another layer to make the experience even more immersive. The recording is from the Errera Channel, a skinny stretch of water between Rongé Island and the western side of the Antarctic Peninsula. The crackling is the sound of popping of bubbles in the ice that in some cases, is thousands of years old. There’s also a chorus of gentoo penguins doing backup vocals if you listen closely, but the melting ice is the star of the show. The crackling is a bummer for two reasons. The first is scientific. The old air in those bubbles holds a lot of secrets researchers would like to unravel. Using techniques to analyze the isotopes trapped in those bubbles gives them clues about what the climate used to be like. Ice cores from the Antarctic have been used to help construct a 800,000 year record of carbon dioxide in the atmosphere. That record has, in turn, given us a sense of just how out of whack the atmosphere is today thanks to human carbon pollution. As the ice melts, scientists lose a little piece of history. The second is existential. On a meta level, we’re all losing a connection to deep time as the ice melts. But on a very nuts and bolts level, the melting ice represents a huge problem, because it contributes to sea level rise. The peninsula, you may recall, is home the Larsen C ice shelf that calved a huge hunk of ice in July. Prior to the massive calving event, the rest of the Antarctic Peninsula had lost 28,000 square kilometers of ice shelves from 1950 through 2010. The ice shelves are floating so they don’t directly influence sea levels. But as they shrink and disappear, more of that ice on land will spill into the sea, melt and end up on shores around the world. Ice has ebbed and flowed since the beginning of time. But now we’re causing it rapidly melt away. The speed up is playing out not just on the Antarctic Peninsula but across Greenland, West Antarctica and mountain glaciers around the world. Heck, it’s even a growing concern in East Antarctica, long thought to be stable. Forman’s recording is a unique riff on a tune that’s becoming all too familiar.